Apple’s default media player, iTunes, is far from perfect. While it does include an online radio broadcaster, media library, and a media player, its user interface leaves a lot to be desired. The hand-holding, prescriptive operating method of Apple also doesn’t give you full control of your own media. But there’s good news – WinX MediaTrans is an alternative to iTunes that works effectively with an intuitive user interface. Download it by clicking here and put an end to your headache. With both NVidia NVENC and Intel QSV integration, WinX MediaTrans reduces the load on your CPU. Whether you re-encode movies before transferring them from Windows to your Apple device, or you are just moving a lot of 4K pictures, its lightning speed will amaze you. It never lags how much ever you move media back and forth, and no other iTunes alternative can match its transfer speed. If you don’t have access to a large memory stick or an external hard drive, no need to fret. MediaTrans has a “Flash Drive” option that lets you drag and drop all kinds of files into your device’s memory. If you prefer to watch videos on your phone but don’t want to stream content off Netflix or have a slow or limited data plan, then just download all the videos onto your Windows PC and transfer them all at once using WinX MediaTrans’ batch transfer option. iTunes, of course, does not have this option, which is why you need a good iTunes alternative like MediaTrans. A big reason why MediaTrans is the best free iTunes alternative is that it can reduce the size of your videos by upto 50% without any significant loss in quality by re-encoding it, thus saving you a lot of memory on your phone. Not only can you import and export any number of songs between your Apple device and PC easily by dragging and dropping, but you can also create, modify and transfer playlists. You can also edit album and artist info, create ringtones and even transfer voice memos without any hassle. 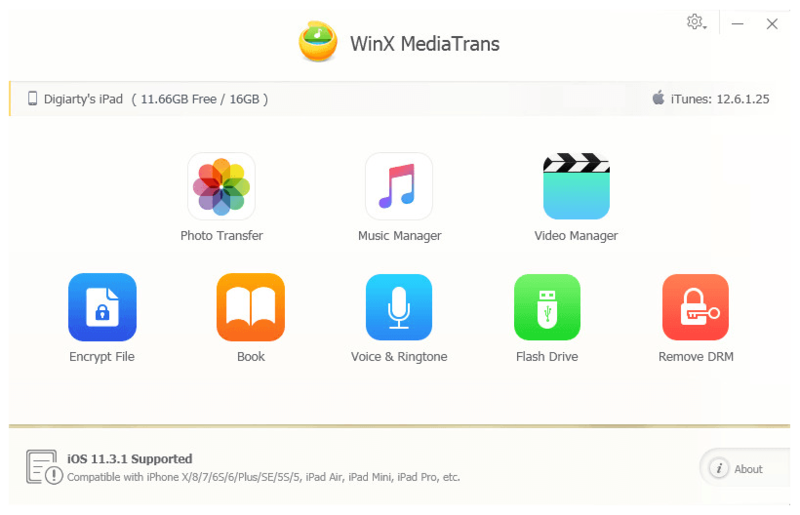 Apple makes you backup your photos to your iCloud, but WinX MediaTrans lets you choose videos and photos to back up and save on your Windows PC either by date shot or by file. Of course, you can also copy your entire photo library to your PC with one click. You can transfer upto 100 4K photos in less than eight seconds. Additionally, it supports almost every format including TIFF, BMP, GIF, PNG, and JPG so the whole process will be a quite smooth sailing. ITunes is singly responsible for a lot of things and thus feels quite cluttered and difficult to navigate. WinX MediaTrans, being the best free iTunes alternative that it is, is without all that extraneous fluff and only keeps what you really need. You will really feel at home getting your work done it because of its easy-to-use functionality. If you particularly enjoy fun-loving videos, you will really appreciate this feature. MediaTrans automatically rotates videos as per need so you don’t miss the golden moment in your video. It supports a variety of file types, including AVCHD, MKV and MP4, which can also be selectively backed up. WinX MediaTrans offers a full version 15-day trial, which you can download from the website. If you like it, you can buy the 1 Year License for 1 PC at only $29.95 with their anniversary offer (original price was $39.95), or the Lifetime License for 2 PCs for only $35.95 (originally $59.95). There’s also a Family License that supports 3 PCs for only $65.95 and gives WinX HD Video Converter for free. For a limited time only, WinX is giving away licensed copies of their best free iTunes alternative on a first come first serve basis. Get yours by entering the giveaway now! If you’re more of “PC” person than a “Mac” person and like dealing with your media your way, MediaTrans is your friend. It’s the best free iTunes alternative out there because of its versatility in functions. It is fast and easily syncs media contents between your iOS device and computer. Say goodbye to iTunes and hello to WinX MediaTrans by downloading it here, or visit WinxMediatrans to know more about the features it offers.